I hope to get a more complete tutorial up at some point, but I wanted to make sure you could at least get started. 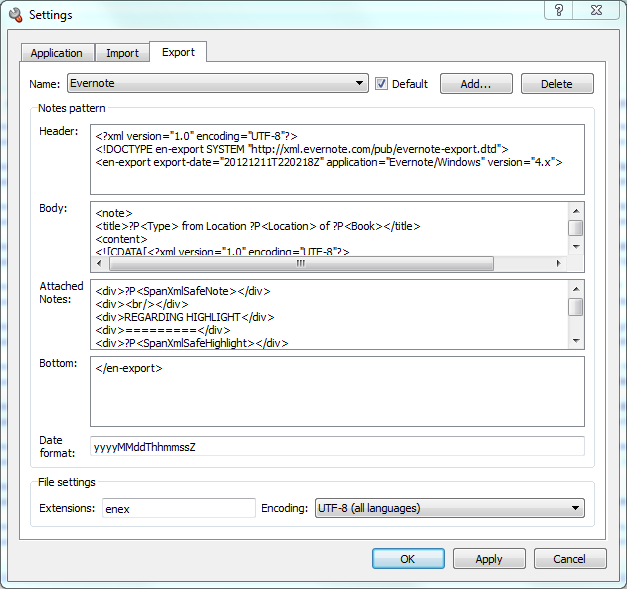 After loading the program, go to Settings and click on the Import Tab. The drop-down shows you the available import patterns. 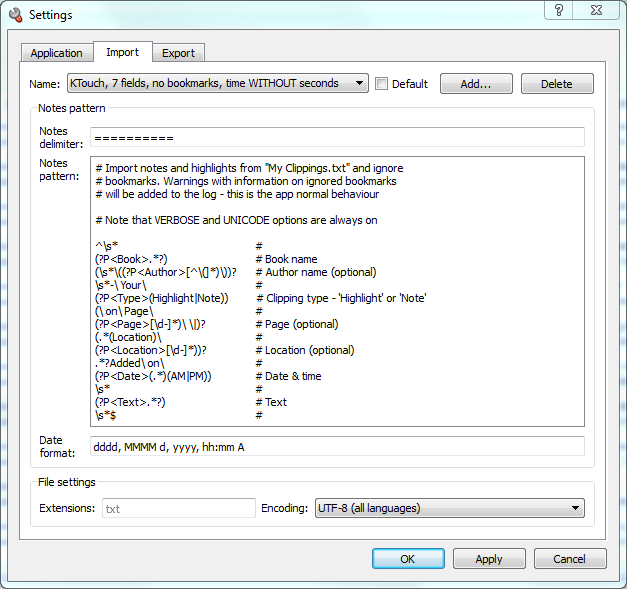 Find the name that matches your system, select it, and ensure the default checkbox to the right of the name is checked. We may have a copy of the pattern you need in our blog (click the Import Patterns Category on the right). If you don’t find what you need, we’d be happy to add a pattern for you. We’ll need details about your Kindle (hardware and software version) and a sample of your “My Clippings.txt” file. Please contact us and we’ll let you know where to send the information. If you want to try and customize the pattern yourself, please check out our guide on Import Patterns. You are unlikely to change this pattern often so you shouldn’t need to come back here very often. If you find yourself importing frequently from two different devices, you can also choose an alternate pattern using the dropdown next to “Import” on the main screen. If you use personal documents (particularly PDFs), you should also ensure that we’re matching notes and highlights in the correct direction. For Amazon files, this isn’t usually a problem. Notes and highlights include location numbers and we can automatically match the ranges with great success. 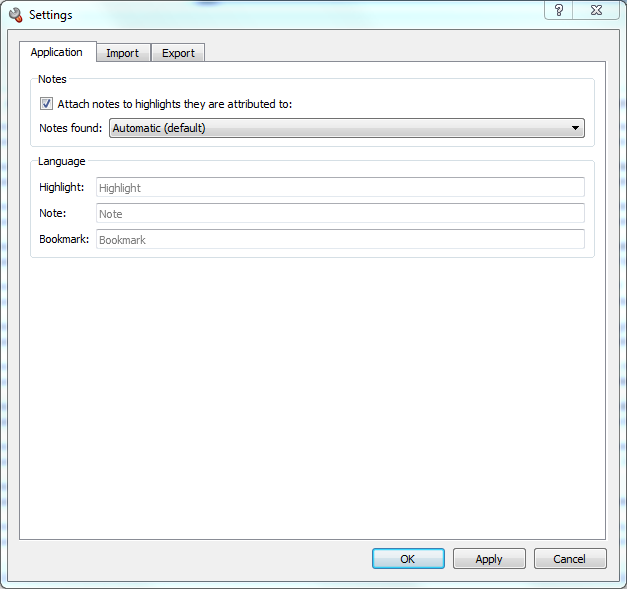 The “Automatic (default)” configuration will try both directions. Personal documents, however, often list pages instead of locations. You may find that you have several highlights from the same page along with each note. If we’re matching in the wrong direction, we’ll match notes to the wrong highlight. 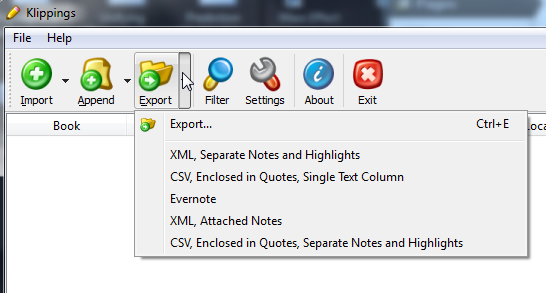 Next, decide what format you want to use as an export. This is configured on the Export Tab under Settings. If you want to select a default, find the name in the dropdown, select it, and ensure the default checkbox to the right of the name is checked. We may have a copy of the pattern you need in our blog (click the Export Patterns Category on the right). Export patterns are much easier to make yourself. Check out our guide on Export Patterns. You can contact us and ask us to make the pattern you need. In most cases, we will ask you to pay for this service (keep in mind that we do not charge for the software or for new Import Patterns). If you find yourself exporting multiple formats, you can access these options more quickly using the dropdown next to “Export” on the main screen. If you do not see entries, the import has failed. We’re trying to improve the error reporting. However, the best option is to contact us. We’ll get back to you with instructions on how to provide diagnostic information. 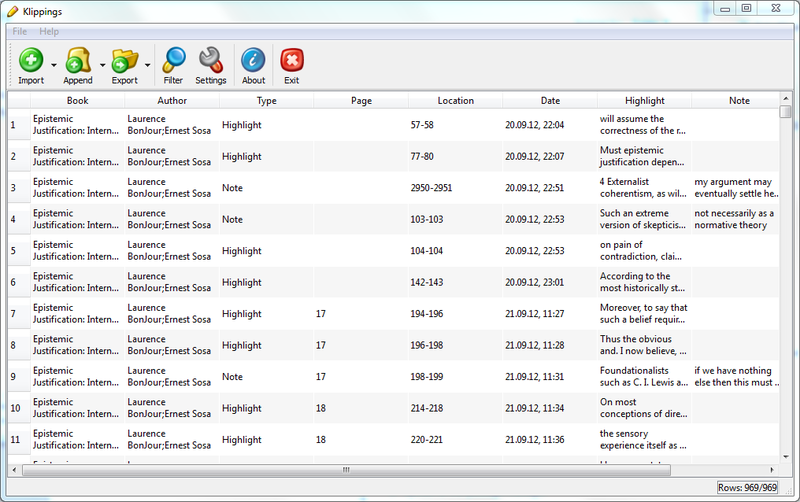 If we have successfully imported your file, quickly review the highlights and notes columns. Make sure that notes are being associated with the correct highlight. If they are not being associated with the correct highlight, try changing the matching direction as we discussed above (Select Default Direction). 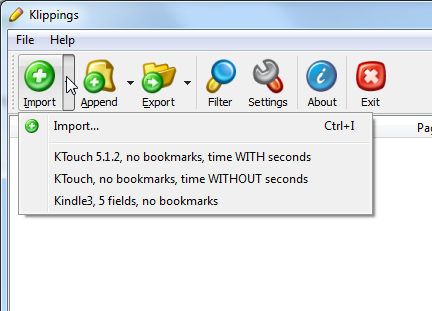 Select the file name you want and hit save. If you do not see the file you selected, the export has probably failed. We’re trying to improve the error reporting. However, the best option is to contact us. We’ll get back to you with instructions on how to provide diagnostic information.